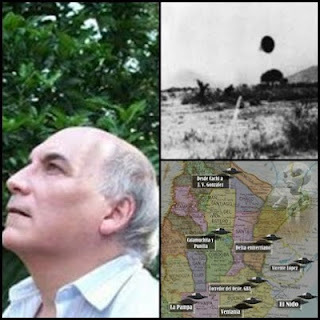 Inexplicata-The Journal of Hispanic Ufology: Luis Burgos: 4 Out of 10 Argentines Have Seen a UFO"
Luis Burgos: 4 Out of 10 Argentines Have Seen a UFO"
These are the statistics kept by the Fundación Argentina de Ovnilogía, which has been investigating the phenomenon for 43 years. “Argentina ranks among the best and most significant UFO activity cases,” Luis Burgos, the organization’s president, told INFONews. In most cases, people say they saw “something in the sky” with many lights, but are unable to say what the “something” happened to be. Unidentified Flying Objects (UFOs) have always been enshrouded in mystery. Their origin remains an enigma. The hypothesis circulated for centuries is that UFOs, or at least some of them, are a means of transportation employed by beings from other worlds or parallel worlds. Luis Burgos is the president of the Argentinean UFO Foundation (Fundación Argentina de Ovnilogia – F.A.O.) and has been researching the phenomenon in the country since 1969. “Aliens don’t land just anywhere. They have hot spots or active areas. In our country, the provinces of La Pampa, Córdoba, some regions of Entre Rios and Salta are hot zones, and in Buenos Aires we find the area known as El Nido, dubbed the “western corridor”, he explained to INFONews. FAO is an open group. It includes office workers, physicians, engineers, businesspeople, police officers or mere enthusiasts. They meet every week in a small store at Calle 10 y 59 in La Plata. They submit photos and videos to analysts, receive e-mails and phone calls about sightings all the time and travel at their own expense when the sighting justifies it. “We don’t profit from the phenomenon; we’re not interested in that,” Burgos says. Mass sightings of these flying objects in our country took place in 1965, 1968 (the biggest year), 1978, 1985 and 2008 (Over 550 cases reported). In 43 years of research, Luis Burgos reported the presence of UFOs on eight distinct occasions. Which of these instances impressed you the most? The one on 4 March 1986, when seven members of FAO witnessed an amazing sighting. It involved two lights that looked like stars, but larger. Their color shifted from blue to white to read. We were some 50 kilometers from La Plata, in the El Espinillo field. When we crossed the cattle gate and stood on the Rio de La Plata side, two objects performed an aerial dance from 9 p.m to 9:45 p.m.: they came, they went, one above, the other below. It shattered all conventional possibilities. In a given moment they came near the group, getting closer and closer, and we didn’t like that at all. “Fellas, let’s run!” I said, in the group, one member who engaged in survival training, said: “Hit the dirt!”. We all dropped to the ground, but the photographer managed to take a photo showing two luminous dots. Burgos stated with conviction that according to his statistical computations, “the next great Argentinean wave will take place in 2015.